Peter Reitzes joins Joel Korte to discuss his life as a former covert stutterer. After four years of co-hosting StutterTalk, Peter tells his story today. 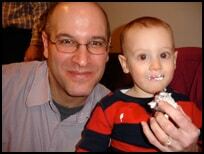 PETER REITZES, MA CCC-SLP (pictured left on his son’s first birthday) is a person who stutters and a New York State licensed, ASHA Certified, Speech-Language Pathologist working in the schools and in private practice. During this episode Joel asks Peter about his life as a former covert stutterer. Peter discusses the awkwardness and challenges of being able to hide and conceal stuttering from a young age until he was 23 years old. Mr. Reitzes discusses why and how he decided to face stuttering openly.